The Pike was @SpeciesofUK from 7th to 13th April 2013. There are seven species of pike and pickerel, which make up the genus 'Esox.' 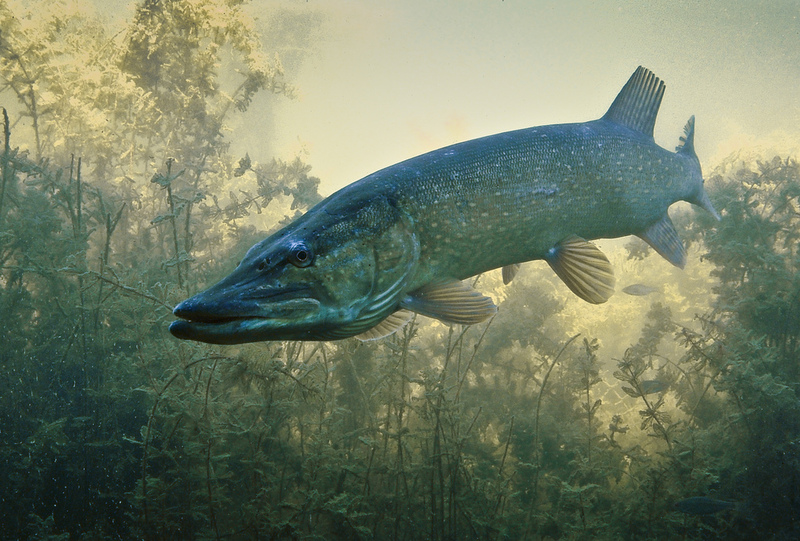 The UK’s pike, Esox lucius, ‘Northern Pike’ or just 'pike,' is the most widespread and well known of these. Pike are found in fresh (and occasionally brackish) water throughout the northern hemisphere, across America, Europe, and Russia. It is a large freshwater predator renowned for its hard-fighting qualities. Pike can be found in all types of freshwater: rivers, canals, lakes, gravel pits, lochs, loughs and reservoirs. River pike are invariably long, lean and fit, due to swimming against the current. Still-water pikes are much shorter and fatter. The pike has been introduced to a number of countries, including Ireland, Spain, Portugal, Ethiopia, Morocco, Tunisia and Uganda, primarily for game. Unusually for a freshwater species, pike are also found in the Baltic Sea. They move in brackish water near the surface, feast on herring and grow extremely quickly. 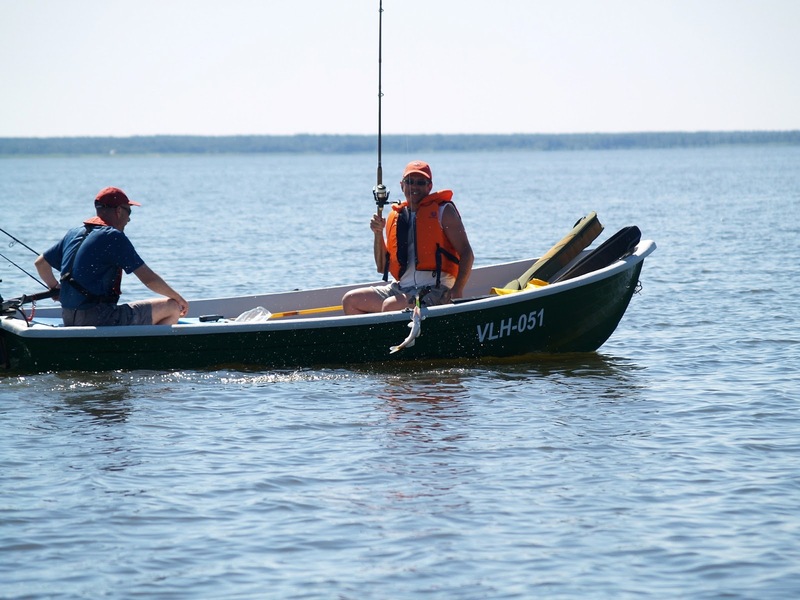 This blog contains some great images of pike being caught in open sea water in the Baltic. The earliest evidence of pike in the UK are one-million year old fossils found in Norfolk. 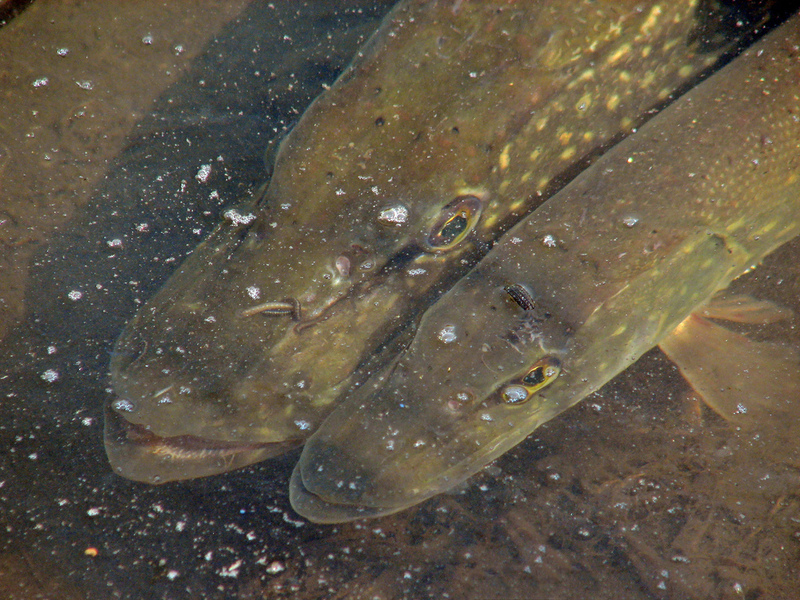 Pike are green or brown in colour with rows of light bean-shaped spots on their side. The underside is cream-coloured. They have a single dorsal (on the back) fin. Pike have scales that cover their entire cheek and the upper half of their gill covers. 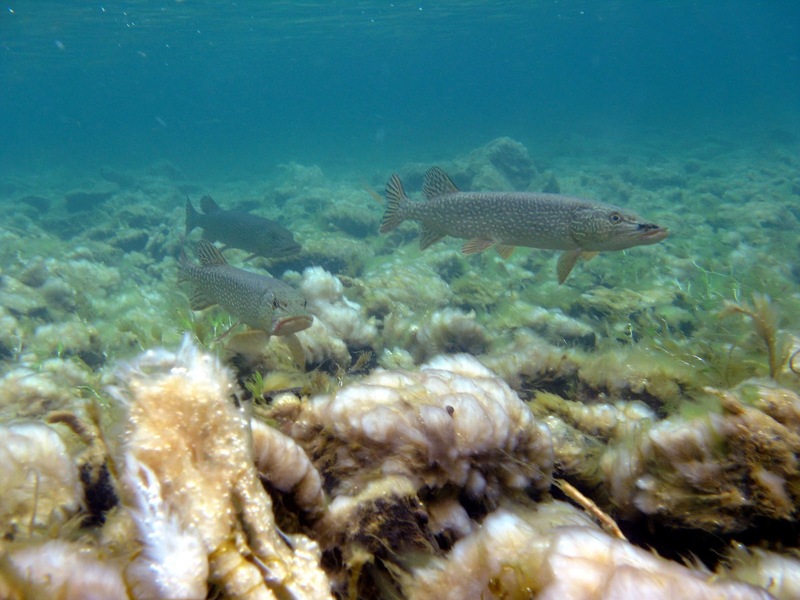 In Italy, the Southern Pike, Esox flaviae, was long thought to be a colour variation of the northern pike but in 2011 it was declared a separate species. The British rod caught pike record is currently 46lbs 13 oz, caught by Roy Lewis from Llandegfedd Reservoir in 1992. Female pikes are larger than male pikes. The male rarely gets larger than 10lb. Juvenile pikes have markings quite different to an adult, wavy lines that haven't developed into spots. Pike have been known to live for twenty-five years, although around eighteen seems usual. The pike has a perfectly adapted hunting technique. It is a 'sprint predator.' It lies in ambush coiled in an 's' shape and moves in a burst of speed to catch prey, as you can see in this video. The pike's long, slim, body, and large tail, ventral and dorsal fins all maximise the speed from one flick of the tail. The pike's eyes are situated near the top of the head and are highly moveable, enabling it to see in almost any direction. They have incredibly sharp jaws. 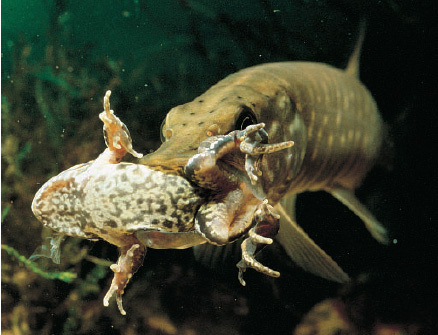 As well as lying in ambush, pike also actively hunt. They seem to do this during certain periods at the same time each day. They eat fish, frogs, small mammals and birds. 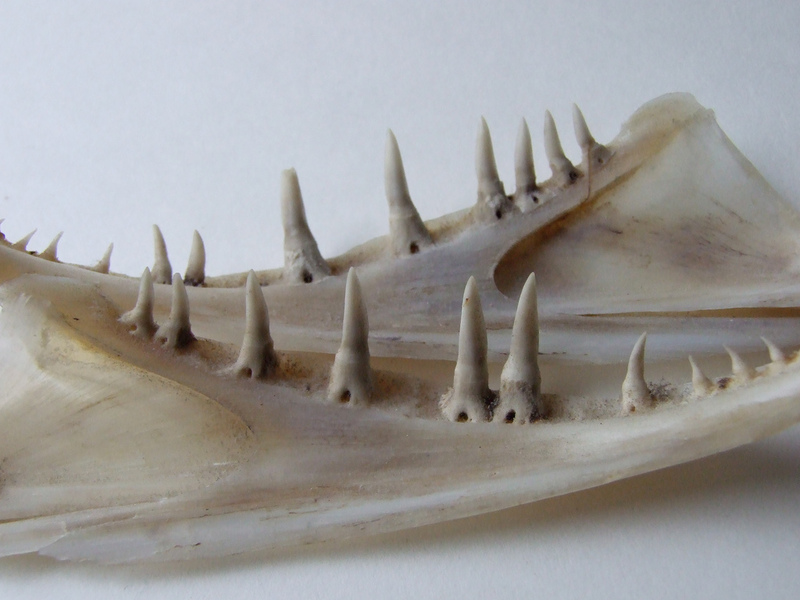 Pike have a distinctive habit of catching prey sideways in the mouth and immobilising it with sharp teeth, then turning it headfirst to be swallowed. Pike usually prefer sick/dying prey and so are essential for clearing stretches of water and preventing spread of disease. Juvenile pike feed upon invertebrates until between 4 cm – 8 cm long, when they start eating fish and other vertebrates. Pikes are usually solitary, but will sometimes gather together, especially prior to spawning. Pike spawn early in the spring, when water temperatures reach 9° centigrade. Several males court a female. Mating lasts several days. They lay their eggs in flooded areas or submerged vegetation. If there's a high density of adults, few young will survive – many will get caniballised. When pike eggs hatch, the young have no mouthparts. They cling to vegetation until they have consumed the yolk sac is consumed, hiding from, among other things, the cannibalistic adults. Young pike eat voraciously and grow quickly. Males are sexually mature at 2-3 years and females at 3-4 years. Pike gets its name from its resemblance to the medieval pole weapon, related to the word for 'pointed.' 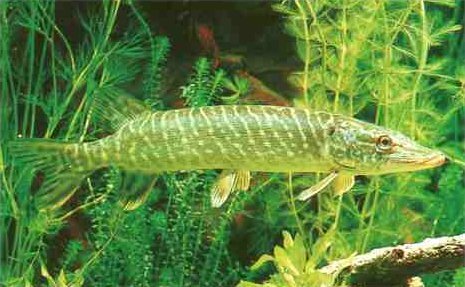 The genus name Esox is related to the Greek and Celtic for 'big fish' and 'salmon.’ In the US the pike is also known as the jackfish. Pike is prized game fish throughout its range and is a commercial food fish in eastern Europe where eating freshwater fish is the norm. 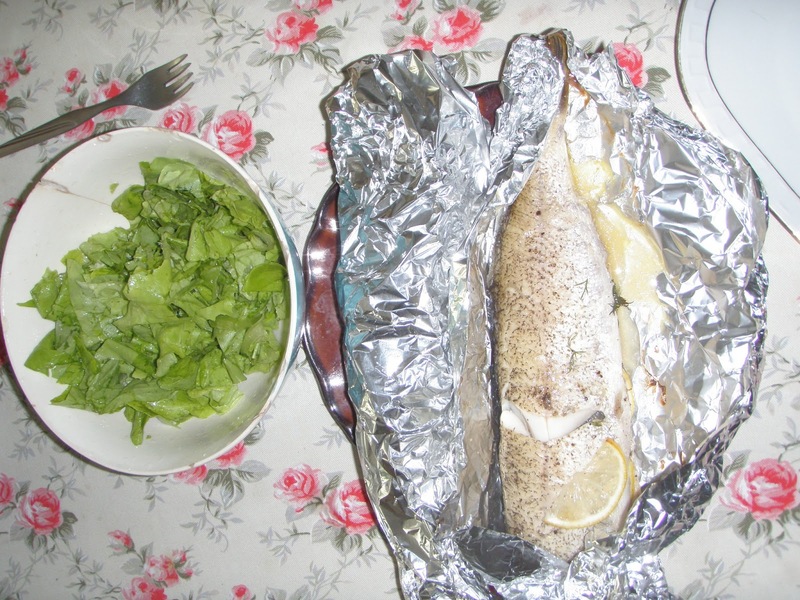 Pike is rarely eaten in the UK although some do prize it as a delicacy. Most are put off by the huge number of Y-shaped bones that need removing from the fillet. The taste is mild. You can eat pike you catch yourself as long as you have a rod licence and permission from the water's owner. Full rules for England are here. Pike aren't threatened in the UK. In other European countries, overfishing is a problem. 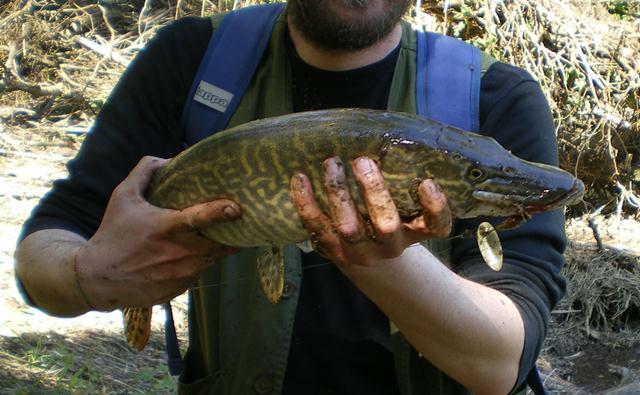 The UK poet Ted Hughes wrote a wonderful poem about pike: "...perfect / Pike in all parts, green tigering the gold. / Killers from the egg: the malevolent aged grin." Read Hughes’s poem in full to help bring to life this fearsome creature.